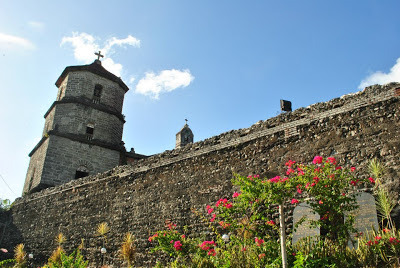 Marinduque, an island tucked in the geographic center of the Philippines, was a fascinating discovery for me. I didn't do much research before going there so I was awestruck to see old and charming Spanish houses lined in its laid-back town and posed against a backdrop of its flawless sea and mountain views. Secured, undisturbed, untamed, raw. This island province is promising, indeed. After spending a beautiful weekend there, I can say that there are more than enough reasons to visit this heart-shaped island besides attending the Moriones Festival, which it is known for. There's no need to wait for the Lenten season since this province offers year-round attractions that are often left out in the tourist trail. Anchi and I arrived in Marinduque on a crisp February morning. It was Valentine’s weekend and instead of heading to the lovers-filled mega malls in Manila, we opted to go off-beat and somewhere near Manila. We were the only tourists when we got there, exactly the kind of place that I was hoping to see -- peaceful and quiet. After getting all our things settled, we explored the town on foot. The poblacion of Boac is basically small and in less than two hours, we were done walking around. We passed by Boac Cathedral, an earthquake-baroque architecture that is still standing tall in that small town. I liked its red-bricked facade, high-ceiling interiors, and the golden retablo. On the rear side of the church, near the Bishop's Palace, we got a bird’s eye view of the whole town. I liked the local people of Marinduque, too. Those we've met during the trip were kind and helpful to us, and we had no issues asking for directions or any problems with dishonest trike drivers. They speak Tagalog and some are well conversant in English so talking to locals was not a problem at all. 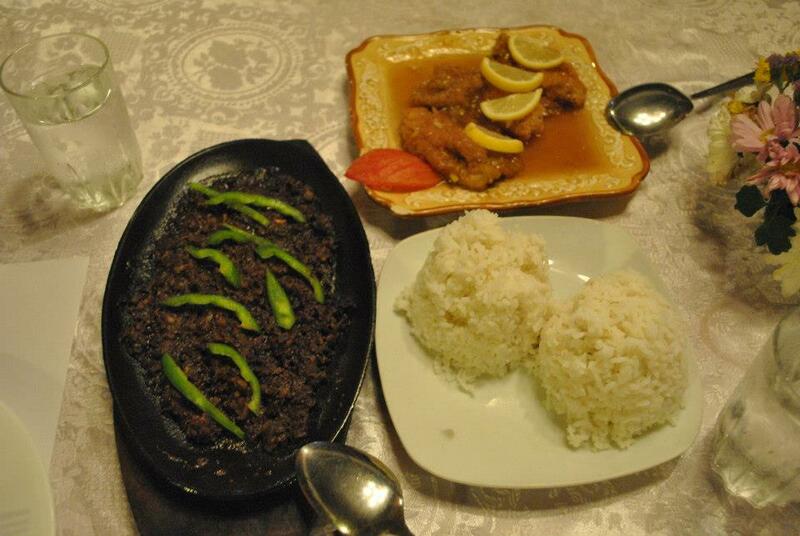 One of my favorite memories of that weekend in Marinduque was the dinner we had at Casa de Emilio, a restaurant located at the second floor of Kusina sa Plaza (just across Marinduque Museum). We ordered the province's specialty Kari Kari which basically tasted like Dinuguan for me. I loved the ambiance and the classic feel inside that ancestral house. They have on display some antiques and it somehow left me thinking how it must have been living in that grand house during its heydays. Another thing that I liked about Marinduque is the fact that it has remained fast-food-chain-and-malls-free. I really appreciate going to places without these familiar business chains that already crowd the metro where I’m from. It's nice having a break from the fat bee and the smiling clown that abounds Manila. Places devoid of these allow me to enjoy the local dishes and to buy pasalubong from local sellers. Although there are no big malls and famous fast-food chains around the main town of Boac, there are eateries and clean carenderias available there. There are also a number of grocery stores around just in case you need something to buy. On our second day, we woke up to a crisp and clear morning in Boac. Since it was a Sunday, we heard the early morning mass at the cathedral and we were lucky to have chanced up the diocese’s Bishop celebrating the mass. He delivered a really long sermon that day. One of the things I like with backpacking Pilipinas is that whenever I hear mass from local churches, I also draw local perspectives from the homily of priests from each place. That day, the Bishop talked about local election matters. After breakfast, we packed our bags and headed to our next destination—Gasan, a town about an hour away from Boac. Almost lunchtime, we made it to Barangay Pinggan in Gasan, the drop-off point to our island hopping adventure to Tres Reyes Islands. We hired a motorized boat to take us to these three islands—Gaspar, Melchor, and Baltazar. Motorboat rent: P700. The first island we reached was Gaspar Island. 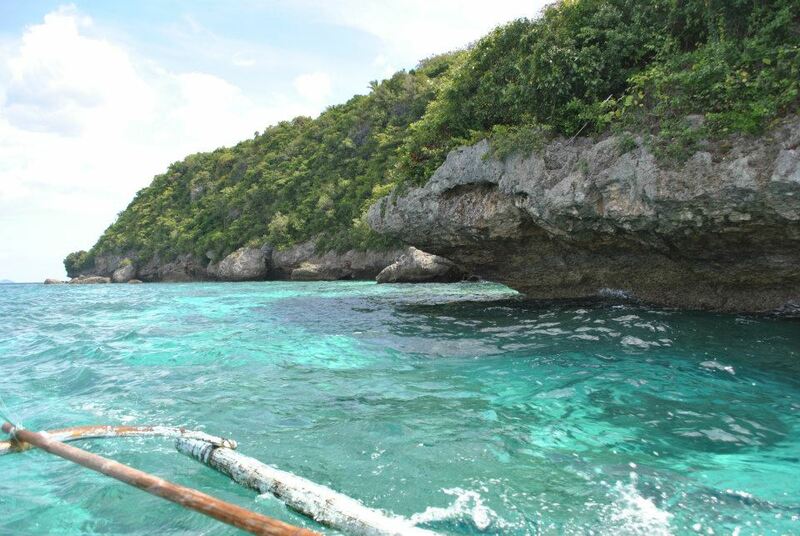 I liked the enticing clear blue-green water which I saw is ideal for snorkeling. As the boat wades along, we saw birds gliding above the water and passing through the thick green mountain of the island. We got to as far as Melchor Island, but due to nasty waves as we were moving towards Baltazar Island, our boatman decided not to push further as it may endanger our safety. So we headed back to Gaspar Island and spent a good one hour bumming in one of its narrow sand strips. After enjoying the beach, the boat waded further and we saw beautiful rock formations along. The boatman informed us where the ceramics, jars and artifacts from the pre-Hispanic shipwreck was said to have been found. We were told that some of the wares were looted and those salvaged items are now found in Marinduque Museum. We were ashore after three hours of island-hopping. Still in Gasan, we went to Blue Castle Beach Resort where we decided to spend the night in. The resort owner, sir Ray, was very accommodating. He was hands-on and even offered us a free tour to Gasan’s neighboring town, Buenavista. Aboard his top-down trike, we had an impromptu sunset drive to Buenavista and had a quick dip at Malbog Sulphur Hot Spring. Dinnertime, they served us a hearty meal and we had a long talk with him about his visions for the development of tourism in Marinduque. He is, I learned later on, a member of the provincial board. I really hope that his good vision for the province will materialize someday. The amazing day was capped by soaking in the wide, clear pool at the resort. Although its beach front has the grayish sand which is typical in Marinduque, Blue Castle Beach Resort is definitely a place I’d recommend in case you get to Gasan. The following day, we raced back to Gasan town proper to visit the church. Although its building is remarkably new, this church is home to a 19th-century bronze bells. There were a few renovations being done while we were there but overall, the one that really caught my attention in the interiors of the church were the massive yellow fan-like designs etched on its ceilings. From the church, we searched for the oldest house in Gasan. Among the many old houses in that town, that ancestral house can’t be overlooked easily since it has a huge Historical Site marker in front of it. I would have wanted to peek inside but no one seemed inside the house at the time we were there. Before heading back to Balanacan Port, we made sure to stop by Marinduque Museum. It houses archaeological artifacts, and showcases historical and cultural icons of the province. I learned a lot about Moriones Festival and the characters joining the Pugutan. Most of the collections inside the museum are jars and plates excavated underwater from the remnants of a sunken pre-Hispanic Chinese vessel. It was almost late afternoon when we traveled from Boac to Balanacan Port. From the seaport, I got to see a fiery sun making its way to the horizon. The afternoon sunset gave me sense of warmth. Tired bones notwithstanding, I felt at peace inside. It was such an amazing trip... Something I'd remember for a long time. That weekend in Marinduque was one that I would want to go to my archives labelled as “My favorite Travels.” It was an amazing weekend that I hope we get to do again someday. -RoRo ride from Dalahican Port, Lucena City to Cawit Port, Boac, Marinduque (average travel time: 3-4 hours). Very nice! I love the Gasan church interior and the prehistoric wares, I think there were a lot of those recovered from marinduque in Ayala Museum. What the sermon of the bishop about anyway? Parang Calle Crisologo sa Vigan ang mga streets ah. OO me pintura na din yung ibang bahay. pero most retained naman yung old structure. i've never been to Gasan and the sites are just awesome. you have good visuals. i like it! the people of Marinduque are really hospitable - hospitability that is beyond the usual. i must say that traditional Filipino values were kept in this colonial heritage province. 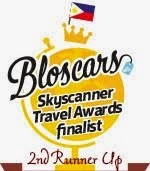 It is truly the heart of the Philippines. Thanks for visiting our beautiful province! please come again....marami pang hidden paradise dun. It's been a decade since i visited the Tres Reyes Islands. We went swimming at Gaspar Island that time. But now i was amazed when we docked in the 2nd largest island which really good for snorkling and diving. There were chambered caves in limestone formation and coral reefs. It's like a paradise island that we didn't see before. Although reaching these islets were not easy because of the strong current of the water only few people trying to see the place. It's good to go there early in the morning and must go back before 12noon because of the water current in the afternoon. It was a great adventure! I must say it is a good write up about Marinduque, my hometown! Good pictures and great destination but its seems you a have a short time visiting there. Perhaps, 4-5 days would allow you to visit all the towns and other must-see destinations. Thumbs up! Planning to go on a solo and budget trip this Fri to Sat, hopefully. This helps a lot. Hi, were you able to go to marinduque alone? I am also planning to go there this weekend but i am having difficulty looking for accomodations.. i hope i can get info from you. Thanks. Hi sir john, were you able to go to marinduque solo? I am also planninh to go there this weekend. I just want to ask where you stayed and your budget. Thanks.